This is the second batch of preserves that I made with summer fruits, along with the peach butter that I blogged about not long ago. This tomato butter is a very unique spread that makes you remember that tomatoes are indeed fruits. Fresh, juicy tomatoes are combined with spices and honey into a spread that is somehow both sweet and savory at once. I'm very curious to see if a taster who wasn't aware of the ingredients could figure out that this is made with tomatoes - for me the taste is rather mysterious. It's definitely fruity, but our tastes buds aren't used to associating tomatoes with this kind of jammy sweetness, and I think the tomato flavor is hard to pinpoint. It's very tasty though, and a nice way to preserve summer tomatoes. 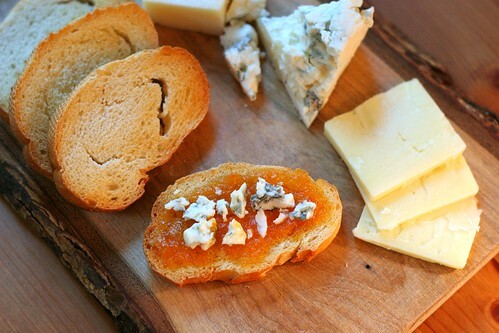 This spread is absolutely delicious with bread and cheese, especially blue cheese. I think it would also be great with pork, chicken, or fish. Tomato season is almost done, so hurry up and make this now! You'll thank yourself in the winter. For a detailed guide to canning and preserving, please see this post. It is a good idea to prepare an extra jar in case your yield is bigger than mine was. Before starting, wash your hands and any kitchen utensils that you are going to use (pots, tongs, etc.). Make sure you have a clean kitchen towel handy. Wash 3 pint jars or 5 half-pint (250 mL) jars, lids, and screw bands in warm soapy water and then set them aside on a clean kitchen towel. In a large pot or sauce pan, crush tomatoes with a mallet or potato masher. Bring tomatoes to a boil over medium-high heat, then reduce heat and boil gently until tomatoes soften, about 20-30 minutes. Working in batches, pass tomatoes through the medium grate of a food mill. Measure 8 cups of tomato pulp and transfer pulp to a large clean saucepan or pot (if you get less than 8 cups, reduce sugar and honey accordingly). Tie ginger, allspice, and cinnamon sticks together in a small pouch made of cheesecloth and place pouch in the pot containing the tomato pulp. Add sugar and honey and stir until the sugar dissolves. Bring mixture to a boil over medium-high heat, stirring often, then reduce heat and boil gently, stirring often, until mixture thickens to a spreadable consistency (to test this, stick a small plate in the fridge until cold. Spoon a bit of the tomato butter onto the cold plate and refrigerate for 1 minute before checking the consistency). This took about 1 1/2 hours for me. 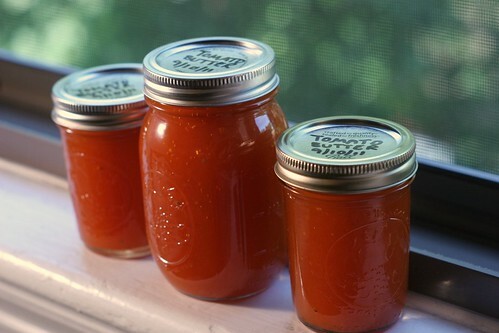 While tomato butter is cooking, place jars on the rack in the canning pot. Fill the canner and jars with water until the jars are full. Cover the pot and bring the water to a simmer (180 deg F). Turn off the heat and leave pot covered so that jars stay warm. Also while tomato butter is cooking, place the flat lids (not the screw bands) in a small saucepan, cover them with water and bring to a simmer (180 deg F). Do not boil the water. Turn off the heat and cover the saucepan to keep lids warm. When butter is ready, discard the spice bag. Working one at a time, remove a hot jar from the canner and place it upside down on a clean kitchen towel to drain for about 30 seconds. Flip it over and carefully ladle hot tomato butter into the jar, leaving 1/4 inch empty at the top. Run a plastic knife (not metal) around the inside surface of the jar to remove air bubbles. Removing bubbles may cause the volume of butter to change slightly, so if necessary, add a bit more butter so that only 1/4 inch remains empty at the top of the jar. Use a damp paper towel to carefully wipe the jar rim and screw threads to make sure that they are clean. Remove a lid from the saucepan and place it on the jar, making sure it is centered. Put on the screw band and screw until it is fingertip-tight. Repeat with the remaining jars. If the final jar is not fully filled, put the lid and screw band on and store it in the fridge - jars that are partially filled will not sterilize properly in the boiling water bath. Place filled jars in the canner and add water to cover jars by at least 1 inch. Cover canner and bring water to a boil. Boil for 10 minutes, then turn off heat and remove canner lid. Wait 5 minutes, then remove jars to a towel on a counter to cool. After jars have cooled for 24 hours, check jar lids to make sure they are concave (curving downwards in the middle). If you press down on the center of the lid, there should be no movement. If you are still not sure of the seal, remove the screw band and lift the jar by the edges of the lid. The lid should stay firmly attached to the jar. If jars are properly sealed, label them with contents and date and store in a cool. dry place. If any jars are not properly sealed, refrigerate them and use within a couple weeks. This looks really good! Unfortunately, I'm stuck with a bunch of green tomatoes, not red. I'm thinking of making a batch of green tomato chutney over the weekend and was also thinking of some similar spices like ginger and cinnamon! Yum. I'm hitting up the farmer's market tomorrow for some tomatoes cause this SO needs to happen in my life. I love how perfectly you've spiced this! Amy - I hope you'll post about that green tomato chutney! Joanne - Let me know how you like it! oh my! what a great idea as a spread for bread!